Despite the near constant news of Brexit and the parliamentary votes, the Conservatives appear to be holding steady at 40%. Labour’s slow downward trend resumed suddenly in February after months of relative stability. The most notable beneficiary was the Others which now includes The Independent Group (TIG) of MPs who left the Labour and Conservative party in February. It should be noted that I am using polls that do not explicitly suggest TIG as an option since they are not yet a formal political party. 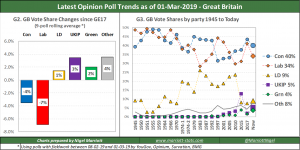 Polls that do suggest TIG are recording some significant vote shares so if and when TIG becomes a party, expect the Others to gain even more share in this chart. The net effect is that it is now Labour that has lost more share than the Conservatives since the 2017 election and the Conservatives now have a 6 point lead over Labour which would be enough for a majority if an election took place now. Under current seat boundaries, the Tories only need a 3 point lead for a majority. This section takes a closer look at trends over the last 12 months. My goal is to discern any patterns that could be a portent of the future. A – A quiet period in the polls with little happening. At most a small drift from UKIP to the Conservatives allowing them to close the gap on Labour. B – An anti-semitism controversy flares up in Labour which hits their poll ratings with some Labour voters defecting to the Lib Dems. The Conservatives take a lead over Labour. C – The Chequers Brexit deal is announced and the controversy costs the Conservatives 3 points and Labour briefly regain their lead. UKIP are the main beneficiaries of the Conservative defections. D – Another anti-semitism controversy flares up in Labour which costs them a point though they slowly recover that. The Conservatives make a slow recovery and the net effect is their 2 point lead is restored. E – The EU withdrawal agreement is published and creates tremendous controversy. Parliament is wracked with debate and divisions and the Conservatives lead over Labour is eliminated. However, the picture is then unchanged for the next 3 months despite the parliamentary shenanigans. F – 8 MPs leave the Labour and 3 leave the Conservative party to form TIG. One explicitly cites anti-semitism as her reasons for leaving and this issue is yet again news in the Labour party. Labour’s vote share drops noticeably with Others the main beneficiary. 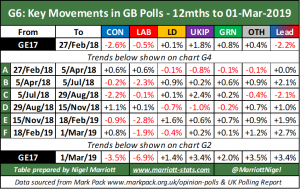 After 12 months of essentially static polls (despite the small movements I can tease out above), February saw a definite move in the polls with Labour falling sharply and Others making gains. At the same time, the Conservative party has managed to maintain 40% despite the dominance of Brexit in the news and the various factions at play in Parliament. As I said back in December, if the Tories can stop Brexit dominating the headlines, I can see them making further gains in the polls. Labour though appears to be in trouble with a clear downward trend and the obvious question is when will this hit bottom. History shows this tends to be the high twenties so there is still a way to go. If this does happen, it will be interesting to see who benefits, TIG, Nationalists, Greens, Lib Dems? I have seen quite a bit of chatter over the last few months about house effect. A house effect occurs when one pollster is consistently showing different results to other pollsters. If that pollster also publishes more or less frequently than other pollsters and you are tracking a 9-poll rolling average like I do, then it is possible for my rolling average to be distorted by house effects. This is long overdue but I have finally taken a look at house effects and the results are very interesting. Over the last 6 months, the two most frequent pollsters have been YouGov & Opinium. It turned out that the other pollsters were very similar so in the graphic to the right, I have lumped all others into Others. As elsewhere, I have focused on the Conservative lead over Labour and there is no question that YouGov is giving more favourable results to the Conservatives than other pollsters. Opinium is largely in line with All Others. 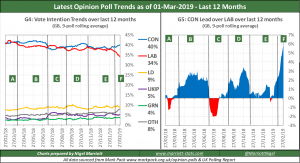 Since YouGov is the most frequent pollster, this implies my rolling averages shown in previous charts G1 to G6 could be showing a more favourable picture for the Tories overall. However, we must be very cautious in drawing a conclusion that YouGov is wrong. A house effect clearly exists but who is right and who is wrong? Only an election can answer that question but until then, I prefer to take an average across pollsters rather than favouring any particular pollster. The question I do need to ask myself is whether YouGov should be downweighted in my 9-poll rolling average since they poll more frequently? So far I have not done so and I am not yet convinced I need to do so. For a start, all pollsters are showing the same narrative of a largely stable picture for 5 months and then Labour losing votes in February. So changing my weights would not change the narrative which is the important bit. But there is also a subtle statistical reason for being cautious and that is whether pollsters are clones or different from each other. I will try and illustrate this point with a simplified example. Suppose YouGov and Opinium are the only pollsters and they each poll once a week. Then each month, we will have 4 polls from each pollster. Assume that a house effect exists and we don’t know who to favour, then clearly we would just take an average of the 8 polls. 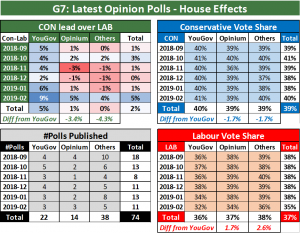 If for some reason, YouGov decided to poll twice weekly, then the existence of a house effect would justify giving each YouGov poll half the weight of an Opinium poll. What table G7 is showing is that other pollsters are to all intents and purposes clones of Opinium. Yes there are more pollsters so perhaps YouGov are the outlier but even though YouGov are the most frequent pollster they still account for a minority of all polls. As far as I am concerned, downweighting YouGov will not have much impact in any case and I have no evidence that YouGov have fundamentally messed up their polling so for now I will continue with my straight 9-poll rolling average. I will keep the situation under review though. I will update this section in a later post. Following the 2017 general election, I analysed why my forecast was in error by such a large margin. I was able to show that the key error was that the opinion polls were not uniform in their underestimate of the Labour vote. In the South and Scotland, the polls were broadly in line with the final results and my forecast was not that far out. However, in the North & Midlands the error was considerable which had a dramatic effect on my forecast. Given this error, it will be a while before I decide to update this section. I have no update to give this month. 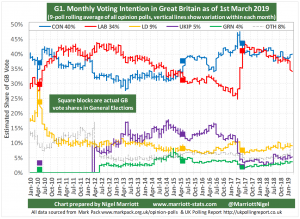 If you are interested in the question of whether there was a “Youthquake” in the 2017 General Election and what the effect of allowing 16 & 17 year olds to vote, then please read my Opinion Poll Tracker of March 2018. How accurate are the opinion polls in the UK? Who is the most accurate pollster in the UK? Do UK pollsters show forecasting skill? My Welsh Barometer Poll forecast was a success! To see my previous Opinion Poll Trackers, please click the relevant month below.